Puddles stands five foot six inches at his back. I cannot see over his back when I am standing next to him. Puddles weighs in at approximately one ton. One ton equals two thousand pounds. I weigh approximately one hundred and forty pounds. Puddles out weighs me by a few pounds. When Puddles does something naughty you say in a firm voice. “No! No! Puddles!” and shake a stick at him. Now just what was I thinking several weeks ago when I bought Puddles? I dreamed. I thought! I dared and I did. Puddles is at home with the Dancing Morgans. Puddle’s job will be to stay and keep my other non-dancing mare Birdy Company when I travel with the Dancing Morgans. Puddles is art. Kinetic art. Come by and feed this gentle giant a cut up apple…he prefers them that way. Give him a scratch on the neck. He loves it. Kick back and watch him eat grass. Enjoy this lovely huge sweet creature for who and what he is. It helps to be crazy in order to be an OX owner. Puddles continues to grow and grow. He weighs in two thousand five hundred pounds. I cannot keep him. I put out the word that I have a tame steer for sale. I sell him to the perfect owner who wants a tame huge steer for his guests to pet. Puddles is the right guy for the job. He loves to be petted while he gently eats an apple from your hand. Puddles has been living away at his new home for two years. Puddles is ten years old. Yesterday, I receive a phone call. Puddles is ill and has been put down. He now lies in a in a lovely meadow beneath a huge oak tree. It helps to be crazy to love an ox. Thanks Poncho ! I am just getting warmed up! Carole, I love your stories. I too wasn’t ready to hear of Puddle’s demise. I was hoping to see him next time I’m up your way. You have such a way of pulling me into your stories. I feel like I’m there. Can’t wait til you’re here at Del Mar. Oh Carole! I always love to read the things that you write. But Puddles ending was a bit of a shock to me as well… I feel very blessed to have known you personally and to have experienced so many wonderful things out at your ranch. What a TREAT you were then and still are to this very day! LOVE YOU MUCH! Somewhere along my parallel path to Carole’s, I was well on my way to being a two and a half ton geriatric homosapien but I decided I’d better loose 40 pounds instead. Puddles will remain a great reminder of why and as such has left no void but lots of wisdom…may he rest peacefully..
you will have all memories in you heart. It´s hard to lost such a friend. I like hearing about the Gentle Giant. I have read stories about Clifford the Big Red Dog to my son, and I was reminded when I read this post. Next year is the Year of the Ox in Chinese Astrology. The local parade was hoping for a tame ox to walk through the streets of Jacksonville, Oregon for the New Year’s parade. Seeing this picture of Puddles, and reading the story, I am encouraged to think that with the right ox and the right cowhand the parade can have the mascot it needs. 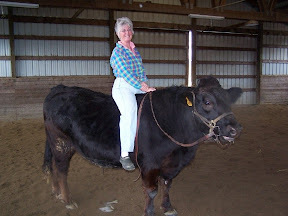 That is so cool that you trained a steer!I am sorry that he is gone now.At least you will always have all those great memories of him.